I like to think of the fire pit as the heart of the backyard. A place where friends and family can gather year round and enjoy good conversation over a cold beverage. With the right outdoor fireplace, you can also add an elegant focal point that will beautify your backyard space for years to come. Choosing a fire pit for your yard is no easy task mind you. There are dozens of options, styles and finishes available in both gas fire pits and wood burning fireplaces. For this article, I wanted to test out a bunch of propane powered fire pits/ fireplaces that would work for nearly any backyard. I chose several different styles and price points and came up with 5 picks that are the best options for adding some fire to your yard. Here is a comparison table showing some of the main features of the fire pits I tested. 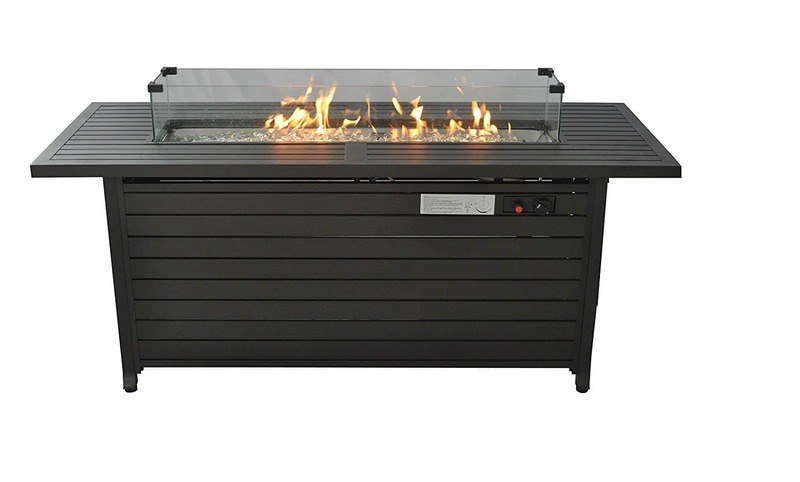 The Legacy Heating fire table is the second-most expensive option on this list, but it has a lot of features to sell it and it’s one of my absolute favorites. It comes with almost everything you need, including lava glass, a wind guard, a lid and a protective cover. The only thing you have to supply is the propane. Additionally, it’s extremely well-designed and mature-looking. This fire table is on the slightly heavy side at almost 74 pounds, but it’s not difficult to assemble. The unit feels sturdy and durable, and the finish hasn’t become tarnished at all over time. I’ll probably use it as a coffee table when it’s too hot to light a fire outside, since the cover is seemingly designed with that use in mind — it folds down into the surface to completely conceal the burner, something that most fire pits aren’t equipped to do. The propane tank is also cleverly concealed in the base. This Legacy unit also has one of the highest heat outputs of any of these fireplaces, with up to 50,000 BTUs of warmth. The included fire glass is clear and classy-looking. All in all, it’s hard to find a major con to this unit. It’s easy to light, it produces plenty of heat, and it stays lit as long as I need it to. The price may be the only factor that could turn some folks away from this option, but it will last for many years, so it’s worth the investment if you’re looking for the best outdoor fireplace for the money. The Legacy aluminum fire table is the Mercedes Benz of fire pits and my top pick. 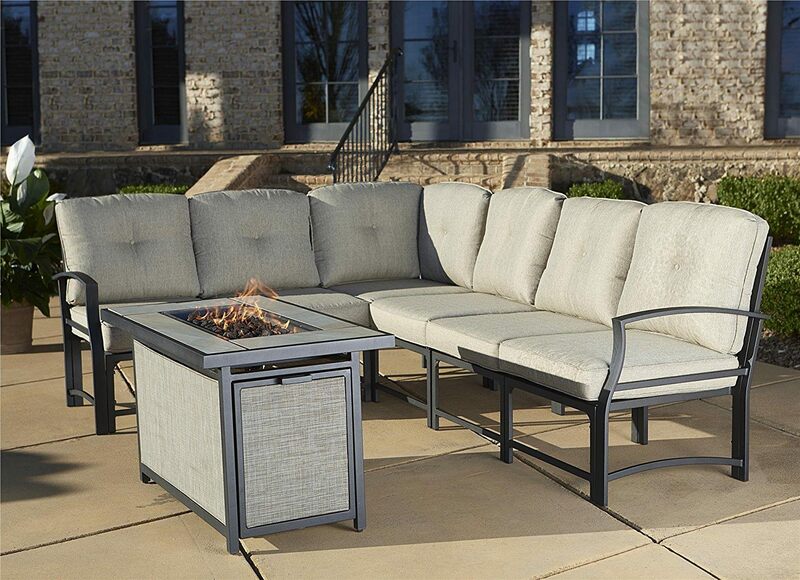 It’s made from high quality materials, absolutely cranks out the heat and comes with all of the accessories you need to start enjoying an outdoor fire right away. Yes, the price is high, like a Mercedes, but this is a fire table that will last for many, many years. You will spend many evenings enjoying a beautiful fire with this fireplace. The Cosco fire pit is a great mid-range choice for a superior quality backyard fireplace setup.. Right off the bat, it became one of my top choices when I discovered it was shipped as a fully assembled product (Love it! )— no assembly or tools required on my end. It’s not too heavy, either, so this is an ideal option for those who want a low-maintenance set-up. 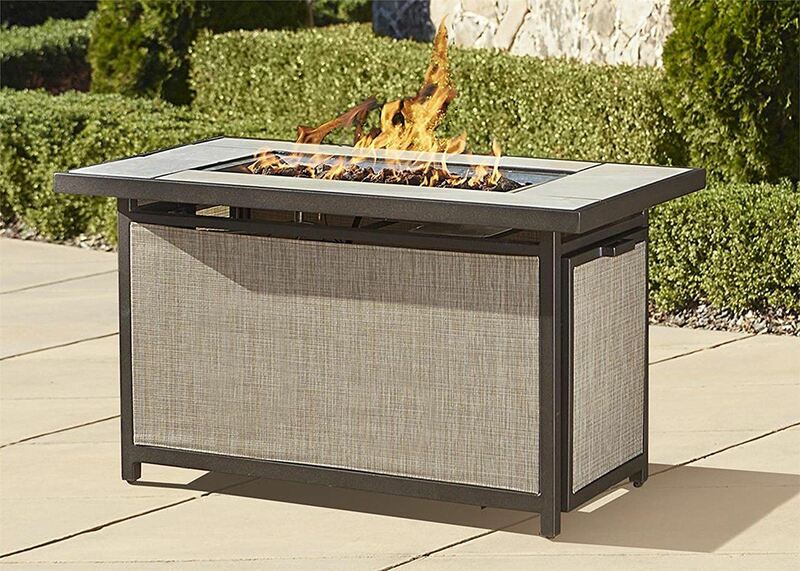 This fire pit is attractive, with a compact minimalist design that will match a variety of color themes. 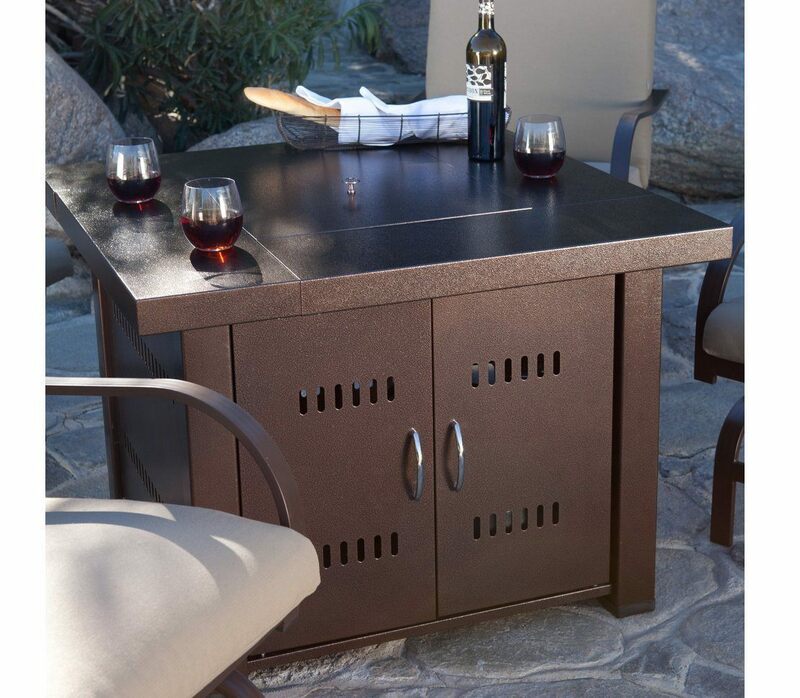 It doesn’t take up too much room on the patio, and it works perfectly as a table when the fire isn’t lit. The ignition is easy to light, and the flame usually stays on as long as needed. It’s easy to adjust the flame to a low or high level. One downside to this unit is that the tiles are rather fragile, and become chipped easily. 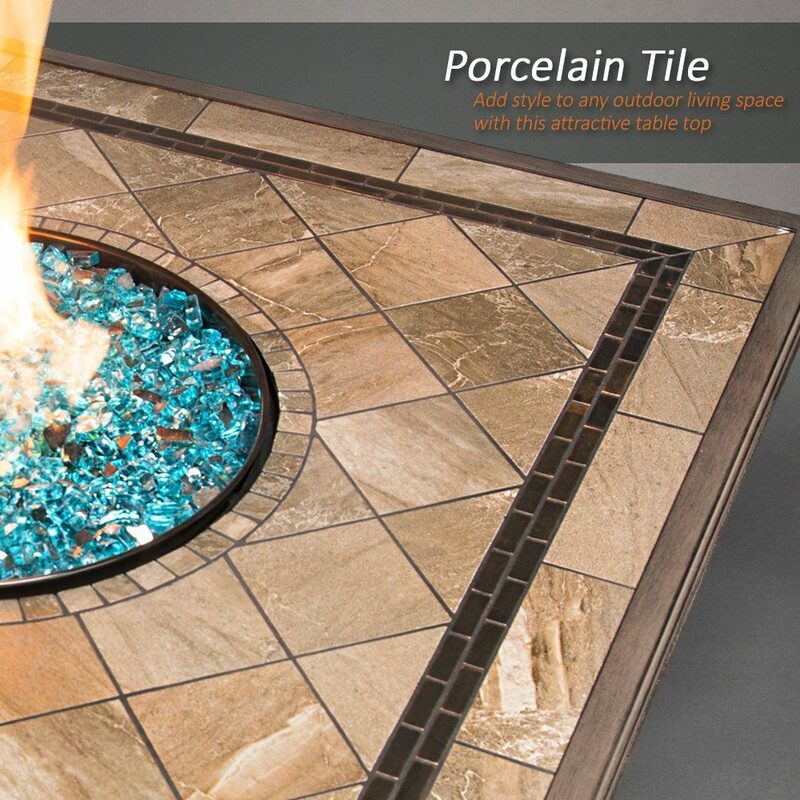 Since the fire pit is shipped as a fully assembled unit, that means that the tile can become slightly chipped during transit. However, I had a great experience with customer service, who promptly shipped a brand-new tile to replace the chipped one. It was a bit of a hassle, but the table looks great now. Another smaller con is that this fire pit doesn’t come with any glass or stones, so those need to be purchased separately. It does come with a lid, however, and the fact that it comes fully assembled is hard to beat. Check out some of the photos and specs of this fire pit below. The Cosco Serene Ridge Fire Table is my favorite mid range fire pit that I had the chance to test. The fact that it comes fully assembled is amazing and it looks stylish too. The 40,000 BTU’s provide ample heat and the burners stay lit even with a mild breeze. You will need to buy the glass or stones separate, but that’s not a deal breaker in my book. 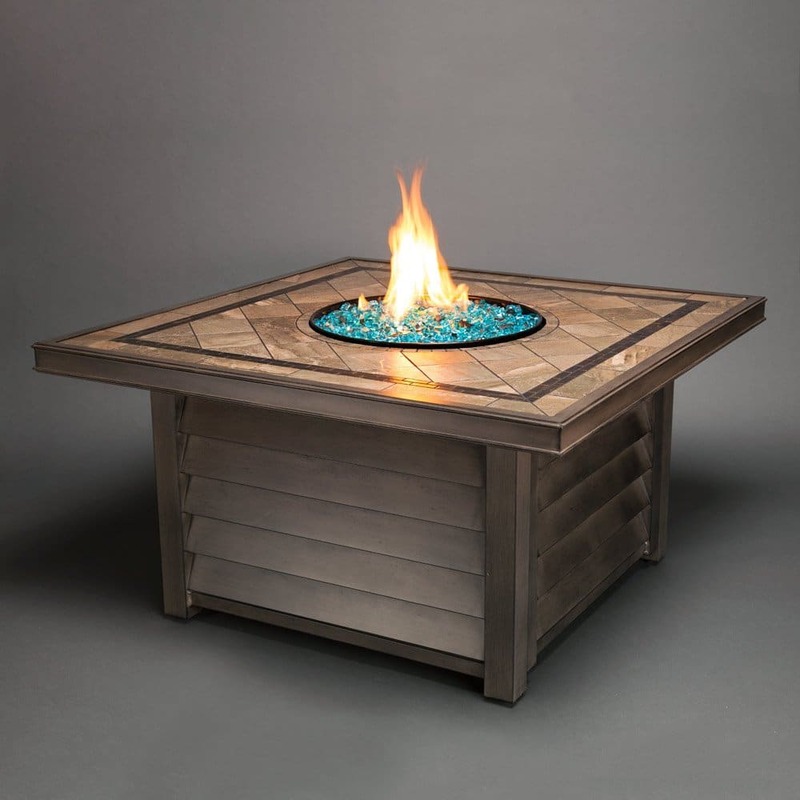 This is an affordable fire table that will look great on any patio. 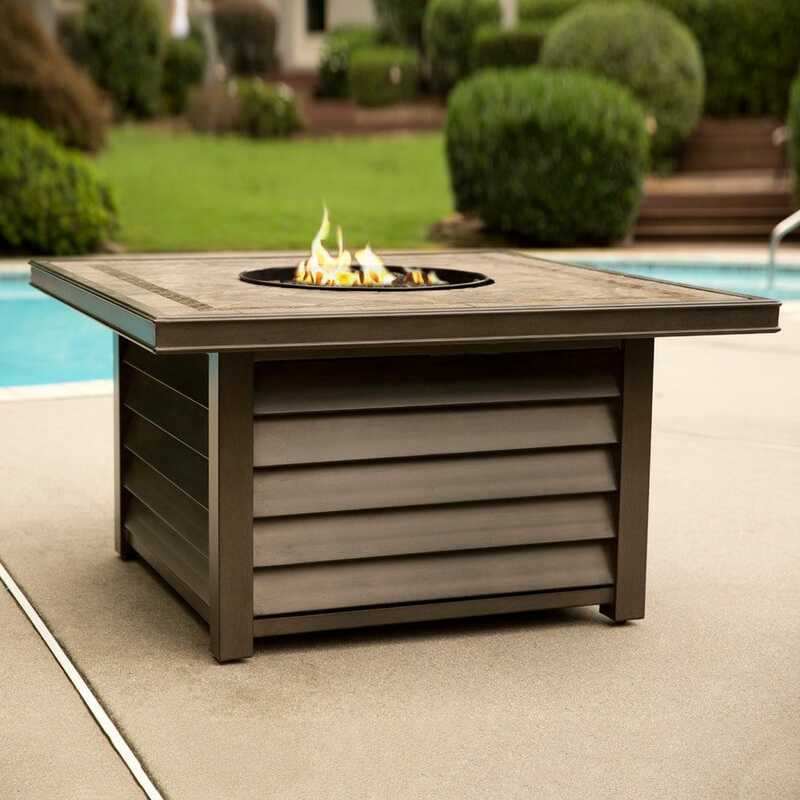 The Agio Winchester outdoor fire pit is the priciest fire table that I tested, but with the higher price tag comes some amazing quality and features that are well worth the cost. This outdoor fireplace is high-end and dependable. The aesthetic alone feels expensive-looking — the surface is elegantly tiled with porcelain, and the aluminum base includes a hidden compartment to conceal the propane tank. With a low height of 24 inches, it could easily become the centerpiece of an outdoor patio area. This unit comes with fire glass as well as a waterproof fabric cover to protect it from the elements. With a higher initial price, it’s nice that it comes with these two high-quality items included. The glass beads are colorful and reflective, and do not become charred with use. 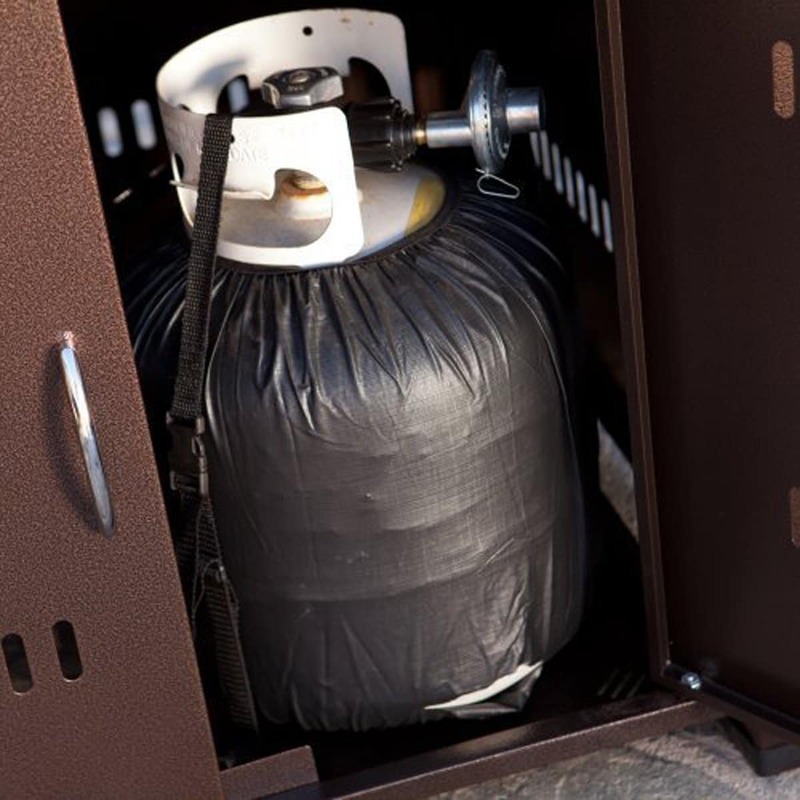 It’s compatible with standard barbecue propane tanks, and it features an impressive heat output of 40,000 BTUs. The gas is easier to light than many low-end fireplaces, with a simple manual push button option. The flame does, however, sometimes need to be re-lit after a while. With a listed burning time of nearly 11 hours, you won’t have to worry about this fireplace running out of fuel quickly. While I haven’t used it for quite that long, I can confirm that it lasts long enough to feed a large family’s appetite for s’mores. We used it all night with no noticeable difference in heat. If the Legacy fire table I reviewed earlier was a Mercedes Benz, then the Agio Winchester is a Rolls Royce. Yes, it’s expensive, but you will have a tough time finding a more attractive, high quality outdoor fireplace that will be the focal point of your backyard. The Agio is easy to light with the push of a button. It pumps out 40,000 BTUs and comes with the fire glass & weather cover. If it’s within your budget, definitely put the Agio on your list of fire pit’s to consider. The Endless Summer fire pit is one of the most affordable yet high-quality outdoor gas fireplaces that I tested. Though it’s low in price, it includes everything that you need to get started, including lava rocks to cover the burner and a protective weather-proof cover. Just buy a standard 5-gallon propane tank and light it up. The unit feels sturdy and durable, but it’s also lightweight enough that you can assemble it yourself without much trouble. It’s compact and attractive. On the other hand, unlike some of my other top picks, it wouldn’t work very well as a centerpiece for me. The surface area is too small to hold many drinks or plates, and there’s no cover for the burner — just a fabric cover to protect the entire unit. It’s better as a dedicated fireplace. 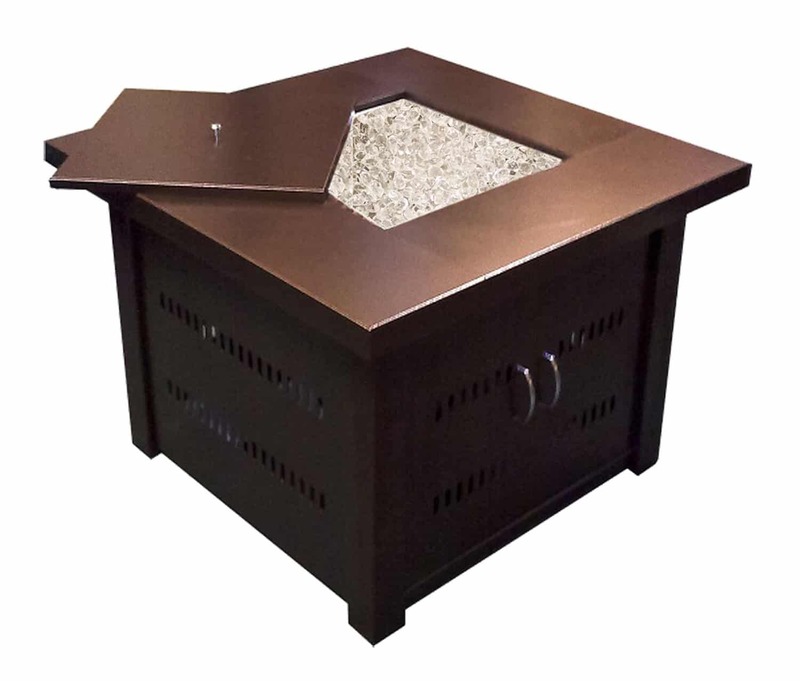 With a heat output of up to 30,000 BTUs, this fire pit doesn’t get as hot as some others. This could be a pro or a con, depending on your needs. If you’re looking for something to keep your patio warm during cold months, this probably isn’t the outdoor gas fireplace for you. If you need something with minimal heat for warmer weather, this fireplace is ideal. This fire pit can also be a bit difficult to use at times, because getting the flame to stay on requires some finagling. Those difficulties are the exception rather than the rule, though it would be nice to have a seamless experience every time. In general, it’s pleasurable to use and well worth the money. I wanted to include at least one fire pit that would work for just about anyone’s budget. The Endless Summer GAD1401M is the perfect balance of quality and price. Sure it’s not as fancy as a couple of the other fireplaces I tested, but it puts out a fair amount of heat, has some room for drinks and looks nice as well. You may have even seen this unit at Home Depot or Lowes as well. If you are looking for an affordable way to add a fire centerpiece to your backyard, you won’t go wrong with the Endless Summer model. My last pick for the top 5 outdoor gas fireplaces is the AZ Patio Heater. It has a couple perks that make it a great choice. First, it’s extremely affordable. At a fraction of the cost of some of the other top choices, it’s a much more accessible gas fireplace. Secondly, you can pay a bit extra to have it professionally installed. Though I didn’t opt for that route, it’s a very useful option for those who need to set it up alone or don’t have tools. This fireplace is incredibly heavy, so it’s nearly impossible to move it around without some help. With an extra hand or two, though, assembly was relatively easy. This unit comes with glass beads, but they’re not very attractive-looking. It also doesn’t come with a cover of any kind. However, since the price is so low, you can splurge on some attractive glass or rocks and a nice sturdy cover. The burner on this fireplace produces plenty of heat, and it’s compatible with standard barbecue propane tanks. The flame is easily adjustable. The surface is somewhat larger and taller than I was expecting for an outdoor fireplace, but it can still be used as a table when it’s not in use. As a whole, this fireplace feels sturdy and durable. The paint, however, is another story. It looks rustic, but it’s easily tarnished by water. This should be an easy thing to prevent with some simple wax protectant, and given the low cost, it seems a worthwhile trade-off. 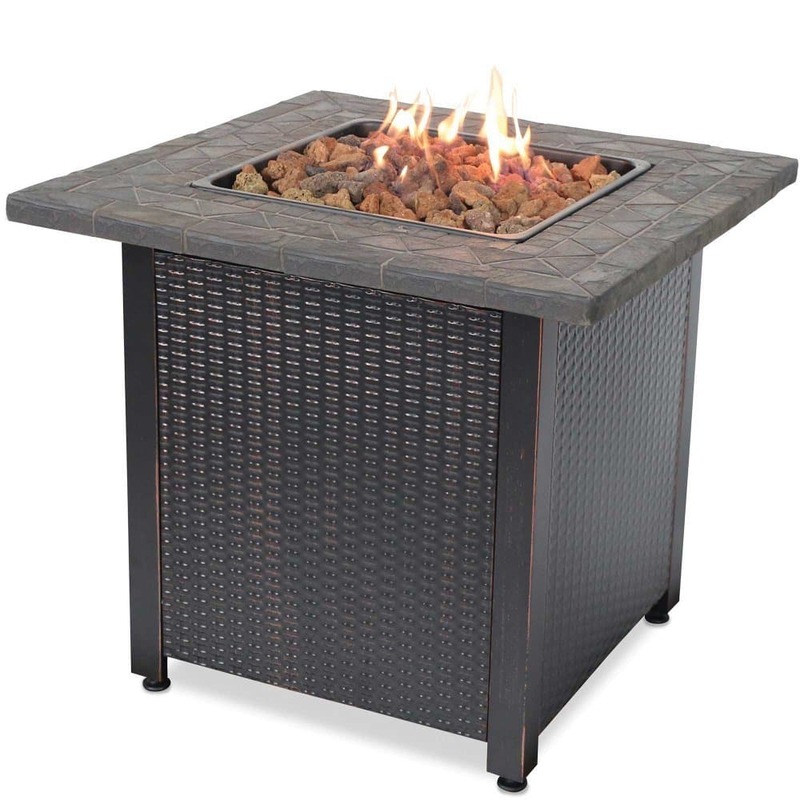 What I really liked about the AZ Patio Heaters fire pit was the solid construction and nice metal finish. The top was prone to tarnishing, but that’s not uncommon with many of the metal fire pits like this one. The glass beads aren’t the most attractive of the bunch, but the price tag on the AZ is very affordable, so you can easily afford to upgrade to nicer fire glass. The flame adjusts easy and puts out plenty of heat. The table top also has a lot of room for drinks and other items. Fire pits make the perfect addendum to any yard’s landscaping. From making s’mores to making an delightful and intimate space for out of doors entertaining, they are as functional as they are stunning. While earlier models needed home owners to keep wood unfilled, more modern gas powered options make lighting an odor free fire simple, as well as as long as more control over the height of the flame. For those that are interested in installing a fire pit in their grass, the following advice can help you select the right one. Even though most of the gas fire pits on the market today have many of the same features, it’s a good idea to educate yourself on a few of the details for what you should be looking at in a backyard firetable. Take a second to read through this buyers guide and you’ll have no problem picking the right fire feature for your yard. Just like with gas barbecues, the number of BTU’s (British Thermal Units) will decide how much heat your backyard fire pit can produce. Most consumer grade fire pits will come in the 30K to 60K BTU range, which is completely ample for putting off a nice level of heat that anyone standing near the fire pit will feel and enjoy. The units I tested were all in the fire table style in varying shapes, but you can also choose a fire bowl or a mobile fire place that looks more like a traditional brick fire place. There are many different materials to choose from as well, from aluminum to cast iron with or without decorative tiles etc. The aesthetics of your lawn, and the amount of space unfilled to you, should be the first considerations in choosing a model that’s most suited to your space. Attractive metal or slate models are excellent selections for homes with a modern aesthetic. 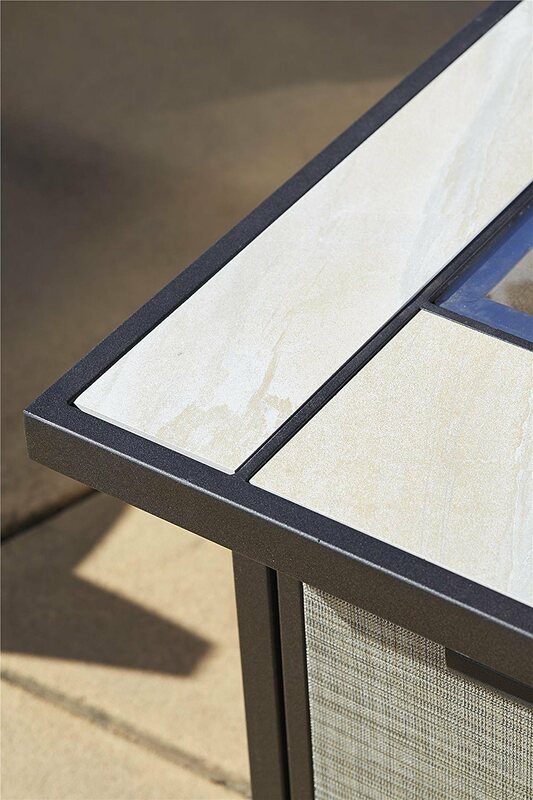 Their clean lines and muted colors allow them to fit completely with refined outside furniture and spare, concrete hardscaping features. Those who live in a rather more rustic area, or whose lawn has a rather more natural feel, may need to deliberate fire pit frames that look as if they were made with uneven rocks or logs. This rustic look will give the feel of a cosy cabin right outside one’s door. Choose the fire pit that fits your eye and will compliment your backyard space. The fire pits I tested all run on a portable propane tank, the same kind as many propane bbq’s use. However, you may choose to go with a wood burning fire pit, which can be more cost effective than having to refill propane tanks often. Propane fire pits are clean and require little to no maintenance, while wood burning pits will require ash removal and take longer to get started/heat up. This is part style and part function, but the type of stone or glass you use with your fire pit will affect how much heat is produced as well as the look of your fire place. Glass fire beads come in many different colors and shapes and have a clean, modern look. Lava rock or stone will look more natural and generally help the fire put produce more heat. Both are available for most firetable applications. If you plan on keeping your pit outside year round, definitely consider purchasing a high quality weather cover for your model. It will keep it looking nice and performing it’s best for many years. For safety, never use your fire pit close to walls or patio covers. Try to place your pit on a fireproof surface such as concrete, stone or tile. Never sit too close to the fire feature as your shoes and clothes can get hot fast and potentially catch fire. Because most fire pits/tables are relatively low to the ground always be mindful of children that may accidentally get too close to the fire.